When I learned that one of my favorite chefs of all time was doing a cooking challenge, I was super elated! I knew without a shadow of a doubt it was fate. Chef Marcus Samuelsson announced the #RedRoosterCookbook Cook the Book Challenge. Once a week until the end of the year, Chef Marcus will post a bonus recipe from is latest cookbook, The Red Rooster Cookbook, on his website. Home chefs (yah, that’s me) can take the challenge by cooking the recipe and instagramming the dish pic using the hashtag #RedRoosterCookbook. Each week, Chef Marcus will select his favorite pic and regram it on his account. Sweet challenge, right? I know! The Cook the Book challenge was mine for the winning, and I couldn’t wait to get started. So why do I think it’s fate this challenge came about? You see, I just so happened to have run into the man himself this summer. It was the strangest thing! I was walking around the Detroit Eastern Market in a Saturday morning (as I usually do … nothing new there). It’s routine for me to go to the market on a Saturday morning to buy fresh fruit and vegetables from local farmers. Actually, the Detroit Eastern Market is the oldest farmers market in the country; as it 1st opened in 1841. Yes, that’s right … 175 years ago. Cool uh? Anyways, I usually arrive at the market around 9 or 10am, but not this Saturday. This time, I didn’t get there until about noon. I really don’t like shopping this late because all of the best produce is either gone or picked over. But this particular time I woke up late. So I scurried to dress and ran out the house. Since I hadn’t eaten in about 12 hours, I ordered take out from the Russel Street Deli (another local gem). There I was … walking down the side walk … basking in the sunlight and minding my own business when I noticed something. Out of the corner of my eye, I saw someone who looked familiar. He was standing alone in front of a store in the market talking on his cell phone. I turned my head as I walked by (in what seemed like slow motion) to get a good look at his face. Then out of nowhere I said, “Marcus?” I sounded like I had just caught a glipse of a friend from junior high, like “Oh hey Marcus! Boy, is that you?” Not Chef Marcus, not Mr. Samuelsson, but Marcus. What was I thinking? 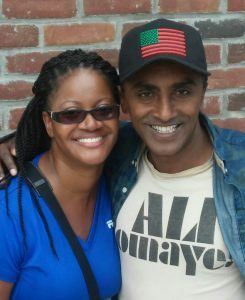 Well, as it turns out, it was the one and only Chef Marcus Samuelsson. Holy S*#t!!! Ok, ok, back to the challenge. 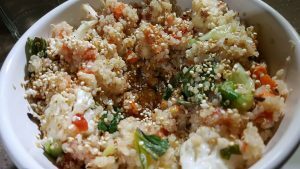 Week one’s recipe is for Warm Quinoa with Vegetables and Eggs. It’s a beautiful culinary experience that combines fluffy quinoa, crunchy cauliflower, and peppery arugula. It also adds a touch of Chef Marcus’s Scandinavian background by incorporating a raw egg. I know you’re thinking after an intro like this I must have won this challenge, but much to my dismay I did not. It’s okay though. I still support my culinary step brothers and sisters (LOL)! Below I’ve posted the pic of my dish that I submitted to this challenge along with the link to the recipe. I hope is that you will attempt this recipe in your own kitchen. With this being a new cooking challenge, I didn’t initially find the recipe. So me being the culinary creator that I am, I was hit with a whiff of inspiration and came up with my own rendition of what Warm Quinoa with Vegetables and Eggs looks and tastes like to me. So … please stay tuned to my blog because I will definitely post this recipe soon. Next Post Detroit Jam Co.